Become a Sight Word Hero! 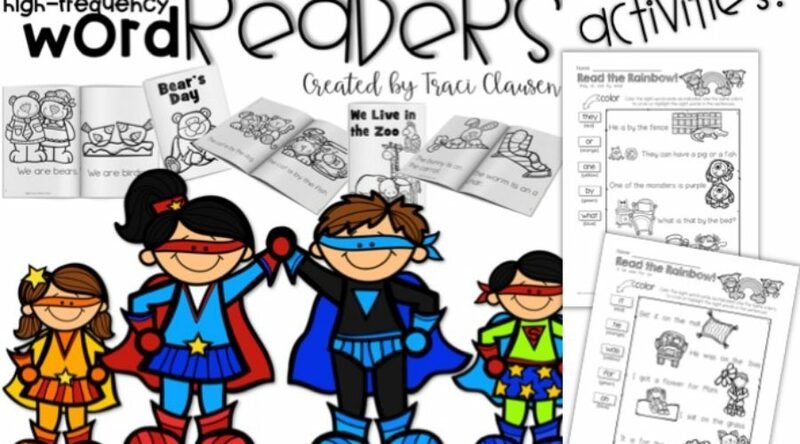 Are your kids sight word heroes? Practicing those high-frequency words can be daunting, but necessary. I incorporate practice throughout the day in a variety of ways. Even my struggling kiddos master those words and build their reading confidence. The Sight Word Hero Series has been a huge help! I have a kiddo who is really struggling to reach grade level standards. Unfortunately he didn’t obtain all that he should have last year and the demands of first grade curriculum are quite challenging. We’ve been working hard and he now has a pretty great grasp on consonant sounds. That dang Y causes some problems. He is now gaining a surer foot with short vowels. But those sight words are proving very challenging. Since this little one struggles a bit with retention of new concepts, we have been working on all of these things with quite a bit of vigor. In addition to modifying his Morning Wake Up and Daily Literacy Practice to something more appropriate to his academic needs, I’ve pulled out some very concentrated sight word work. In order to help him master a sizable amount of sight words, I have him working on the same few sight words over a lengthy bit of time. The goal is to lead him to knowing the words without hesitation as the rest of the class was able to do during the previous months and their prior year in school. I work with this little one 1:1 daily as he isn’t able to work with even my most challenged reading group. We study the words he is to work on, read the sentences together, repeat after me and play “search for the word”. While I cannot work with only him during guided reading, I do want to be sure he is engaged in working on the words we are studying while I am working with the other students. So, after we’ve worked on worksheets together, his job is to identify the words by color. Reciting those words we’ve practiced while coloring/highlighting each one. This not only gives him more opportunity to work with the words we’ve worked on, it also deepens his learning and lengthens his engaged work time. I give substitute directions on pages I assign to him. By changing the directions periodically I am encouraging active engagement and thinking – even though the task at hand is familiar. That familiarity is comforting when he his tasked to work on his own. The activities work well for all of my students because I change the demand for the assignments. I ask them to use shapes to identify particular words (circles, squares, triangles). Additionally, I remind them to work toward comprehension. If the sentence they are reading mentions a color of an image, color that image accordingly. Changing the demand of certain worksheets takes a quick, and lower level depth of knowledge task to a whole new level. This type of practice can be done with any set of similar worksheets. The ones I’ve shown here are from my Sight Word Hero resource. The key is to maintain the focus on the same set of words for a period of time with a similar main objective. Adding a few elements to the directions (color, read to a friend, search for the words noted in your library book, create a code, etc.) simply creates a more robust guided reading lesson or a greater challenge during independent work. There are many ways to practice sight words. Flash cards are fabulous and many games can be played with them. Kiddos love to create words with Play Dough or even practice writing them on something as simple as a white board. My kiddos even use our play iPhones to “text” sight words to one another. I love using our interactive word wall. The kids get so much out of working with the wall as a class, in groups and independently. It’s a favorite word work spot. Using readers is invaluable, however, because it places these words in real world context – BOOKS! Beginning with easy readers that contain repetitive word patterns allows the focus to remain on the words that are to be attacked, but also allows for the incorporation of other reading skills, like blending sounds and using pictures cues that correspond with beginning and ending sounds. I look to use books that are similar in format and that my kiddos can WRITE and COLOR in. Copied readers are the best! As the books increase in complexity, the change grows smoothly while the activity remains familiar. Just like with worksheets, I LOVE using color to help highlight the words to be mastered. It allows for the comfort of familiarity, while helping students to dig deeper into their depth of knowledge by applying their skills to another form. I match the worksheets and the readers. Many of them cover the same words so there are lots of practice opportunities. I work on the same words in a variety of ways over the course a many days or even a few weeks – especially with early learners in Kinder and my little struggling students. But, it’s not only for those strugglers. The repetition of maintaining word focus helps develop mastery in all students as they work to develop those word identification skills rote. These readers from the SUPER Sight Word Schema Builders work on a set of approximately 9 words independently and then cumulate in readers that not only contain all of the words but also have a slightly more complex sentence pattern and have words hidden within their images. Additionally, they work on the words in the same grouping as the worksheets in the Sight Word Super Hero resource. These books maintain the word focus within the entire classroom while providing challenging, independent practice activity for advanced kids. This unit comes with guided reading group and differentiation instructions. YOU CAN GRAB A SAMPLE OF THIS RESOURCE HERE! These units are available in a money-saving bundle. Giving yourself permission to “hang out” on only a few words for a while is OK. So often we feel pressure to MOVE ON. This doesn’t always lend itself to mastery – but a brief overview. And that generally isn’t enough for a lot of kiddos. Use color. Write in readers. Find words of focus in other materials used throughout the day. Assign a word a color and highlight that word in that color every time you see/find it. Thanks for writing this informative aritcle.